This article is about the meteorological effect of "wind chill". For other uses, see Wind chill (disambiguation). Wind-chill or windchill (popularly wind chill factor) is the lowering of body temperature due to the passing-flow of lower-temperature air. A surface loses heat through conduction, evaporation, convection, and radiation. The rate of convection depends on both the difference in temperature between the surface and the fluid surrounding it and the velocity of that fluid with respect to the surface. As convection from a warm surface heats the air around it, an insulating boundary layer of warm air forms against the surface. Moving air disrupts this boundary layer, or epiclimate, allowing for cooler air to replace the warm air against the surface. The faster the wind speed, the more readily the surface cools. Many formulas exist for wind chill because, unlike temperature, wind chill has no universally agreed upon standard definition or measurement. All the formulas attempt to qualitatively predict the effect of wind on the temperature humans perceive. Weather services in different countries use standards unique to their country or region; for example, the U.S. and Canadian weather services use a model accepted by the National Weather Service. That model has evolved over time. The first wind chill formulas and tables were developed by Paul Allman Siple and Charles F. Passel working in the Antarctic before the Second World War, and were made available by the National Weather Service by the 1970s. They were based on the cooling rate of a small plastic bottle as its contents turned to ice while suspended in the wind on the expedition hut roof, at the same level as the anemometer. The so-called Windchill Index provided a pretty good indication of the severity of the weather. In the 1960s, wind chill began to be reported as a wind chill equivalent temperature (WCET), which is theoretically less useful. The author of this change is unknown, but it was not Siple or Passel as is generally believed. At first, it was defined as the temperature at which the windchill index would be the same in the complete absence of wind. This led to equivalent temperatures that exaggerated the severity of the weather. Charles Eagan realized that people are rarely still and that even when it was calm, there was some air movement. He redefined the absence of wind to be an air speed of 1.8 metres per second (6.5 km/h; 4.0 mph), which was about as low a wind speed as a cup anemometer could measure. This led to more realistic (warmer-sounding) values of equivalent temperature. Equivalent temperature was not universally used in North America until the 21st century. Until the 1970s, the coldest parts of Canada reported the original Wind Chill Index, a three or four digit number with units of kilocalories/hour per square metre. Each individual calibrated the scale of numbers personally, through experience. The chart also provided general guidance to comfort and hazard through threshold values of the index, such as 1400, which was the threshold for frostbite. When the temperature is −20 °C (−4 °F) and the wind speed is 5 km/h (3.1 mph), the wind chill index is −24. If the temperature remains at −20 °C and the wind speed increases to 30 km/h (19 mph), the wind chill index falls to −33. where Twc is the wind chill index, based on the Fahrenheit scale; Ta is the air temperature in degrees Fahrenheit, and v is the wind speed in miles per hour. As the air temperature falls, the chilling effect of any wind that is present increases. For example, a 16 km/h (9.9 mph) wind will lower the apparent temperature by a wider margin at an air temperature of −20 °C (−4 °F), than a wind of the same speed would if the air temperature were −10 °C (14 °F). The 2001 WCET is a steady state calculation (except for the time to frostbite estimates). There are significant time-dependent aspects to wind chill because cooling is most rapid at the start of any exposure, when the skin is still warm. The Australian formula includes the important factor of humidity and is somewhat more involved than the simpler North American model. The North American formula was designed to be applied at low temperatures (as low as −46 °C or −50 °F) when humidity levels are also low. The hot weather version of the AT (1984) is used by the National Weather Service in the United States. In the United States, this simple version of the AT is known as the heat index. ^ Vincent J. Schaefer; John A. Day; Jay Pasachoff (1998). A Field Guide to the Atmosphere. Houghton Mifflin Harcourt. ISBN 0-395-97631-6. ^ Eagan, C. (1964). Review of research on military problems in cold regions. C. Kolb and F. Holstrom eds. TDR-64-28. Arctic Aeromed. Lab. p 147–156. ^ "Environment Canada - Weather and Meteorology - Canada's Wind Chill Index". Ec.gc.ca. Retrieved 2013-08-09. ^ "Meteorological Tables, Wind Chill. August, 2001 Press Release:". National Weather Service. Retrieved 14 January 2013. ^ "Wind Chill". BBC Weather, Understanding weather. BBC. Archived from the original on 11 October 2010. ^ Osczevski, Randall; Bluestein, Maurice (2005). "The new wind chill equivalent temperature chart". Bulletin of the American Meteorological Society. 86 (10): 1453–1458. Bibcode:2005BAMS...86.1453O. doi:10.1175/BAMS-86-10-1453. ^ "Calculation of the 1971 to 2000 Climate Normals for Canada". Climate.weatheroffice.gc.ca. 2013-07-10. Archived from the original on 2013-06-27. Retrieved 2013-08-09. ^ a b "NWS Wind Chill Index". Weather.gov. 2009-12-17. Archived from the original on 2011-09-18. Retrieved 2013-08-09. 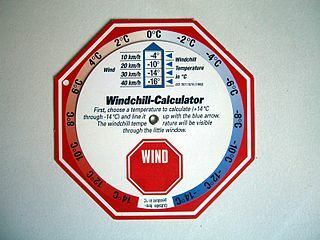 ^ "A chart of windchills based on this formula". Weather.gov. 2009-12-17. Retrieved 2017-04-13. ^ Tikuisis, Peter; Osczevski, Randall J. (2003). "Facial Cooling During Cold Air Exposure". Bulletin of the American Meteorological Society. 84 (7): 927–933. Bibcode:2003BAMS...84..927T. doi:10.1175/BAMS-84-7-927. ^ "The Apparent Temperature (AT) - Heat Index". Bureau Of Meteorology, Australia. Bom.gov.au. 2010-02-05. Retrieved 2018-08-01. ^ "The formula for the apparent temperature". Bureau Of Meteorology, Australia. Bom.gov.au. 2010-02-05. Retrieved 2013-08-09. Wikimedia Commons has media related to Wind chill. Look up wind chill in Wiktionary, the free dictionary.